President of the Institute for Pan-African Strategies, Peace-Security-Governance (IPS) since 2012. He is also President of the Citizens Panafrican Mouvement (Luy Jot Jotna), former OIC Special Envoy to Central African Republic (2014-2017), OIC Secretary General former Special Representative for Africa (2016-2017). He was Senior Minister and Minister of Foreign Affairs of the Republic of Senegal (2000-2009). 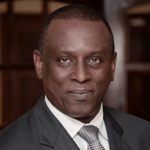 He is also Chairman and CEO of SARATA HOLDING LLC, a consulting and advising Firm for “Business and Development Partnerships with Africa” since 2009. On October 17, 2002, he signed a Cease fire Accord with the leaders of the rebellion in Côte d’Ivoire. In March 2008, he led and successfully concluded on behalf of the Heads of State the Peace Agreement which ended the military conflict between Chad and Sudan. From 2003 to 2009, he led several mediation missions particularly in Mauritania, Guinea Bissau, and between the US and Libya. He holds a DEA from Paris Sorbonne V and a PhD in communication & International Development from The Ohio State University.